Audio recording software for Windows. Record all what you hear! Audio recording software for Windows. Audio Recorder Plus boasts almost all features you like to see in a recording application. It does a crackerjack job recording audio from a wide variety of audio sources, including your PC's line-in jack, a microphone and streaming audio applications. It have a attractive design and system-wide hot keys that allows you to start/stop recording from any application. The VOX (voice activation) system, wich pauses recording during silent pauses, turns the Audio Recorder Plus into the full-featured voice recorder. Auto-splitter and auto-stop functions will be useful if you need to digitize your old good vinyl or audio cassettes. Clicking the Options button lets you select audio codec, compression options, recording devices and input level. AGC (Automatic Gain Control) will check input level during recording and adjust it automatically for better performance. 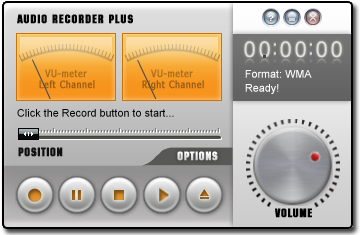 Unlike standard Windows Sound Recorder, Audio Recorder Plus lets you record streaming audio, music and voice directly into the WAV, MP3 and WMA formats. VBR mode supported for both MP3 and WMA encoders and allows you to achieve better audio quality in a smaller audio file. Flexible naming rules allows you create file name from many variables like current day of week, current date and time. You can't simple convert MIDI and protected M4P, WMA files, but Audio Recorder Plus lets you re-record this files into MP3 format during playback. All you need to do is start playback of MIDI file using Media Player and select the "Stereo Mix" input inside Audio Recorder Plus options. "I had evaluated several MP3 recorder products and found the Audio Recorder Plus to be the best one. The choice was based on good technical performance, feature set, user friendly graphical interface, excellent technical support, and commitment to improvements in future versions."